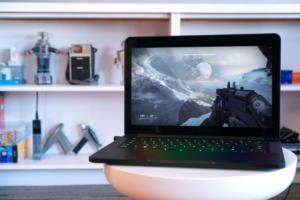 Ready to relax with a calibrated beer? 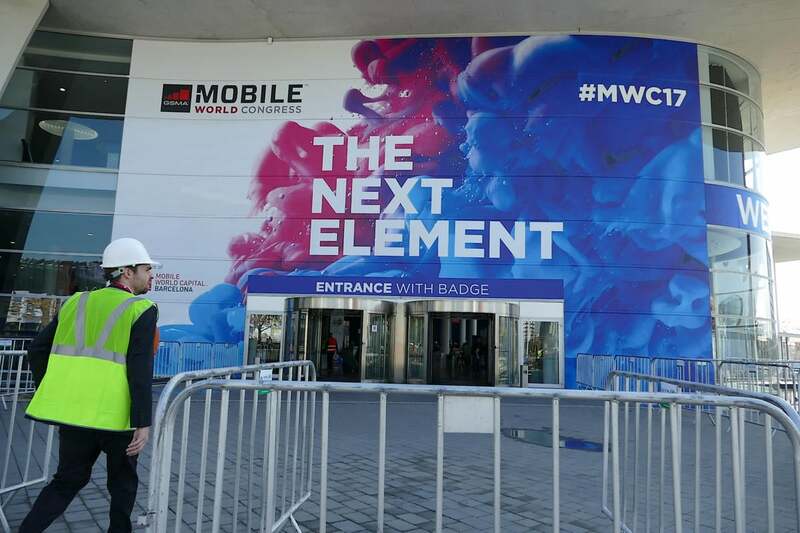 Along with all the hype about phones and 5G networks, Mobile World Congress 2017 was also a showcase for the internet of things, including IoT gear for enterprise and government use. Harman demonstrated a vibration sensor on this industrial motor. The company sells a system or managed service for detecting problems that are starting to emerge in industrial equipment. 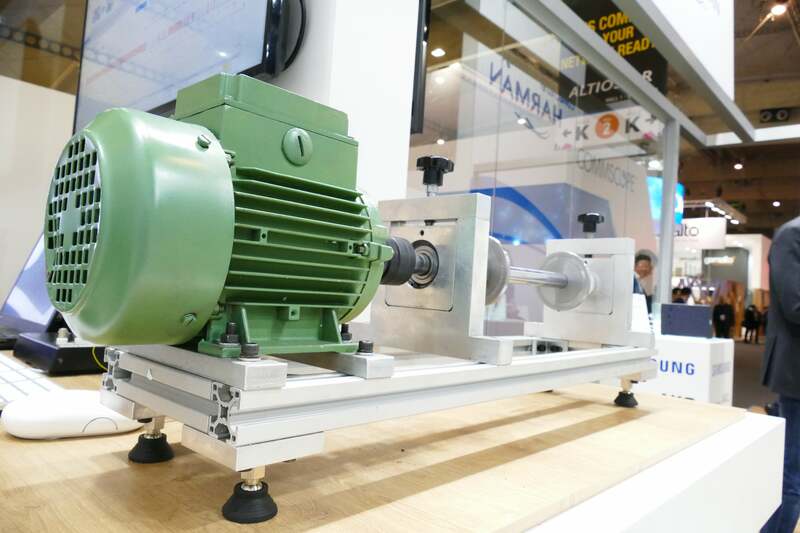 The back-end software that interprets the motor sensor's readings can start learning about the characteristics of a particular motor as soon as the system is installed. Engineers can also take action when they sense a problem using their own experience, then add that knowledge to the machine's learning. 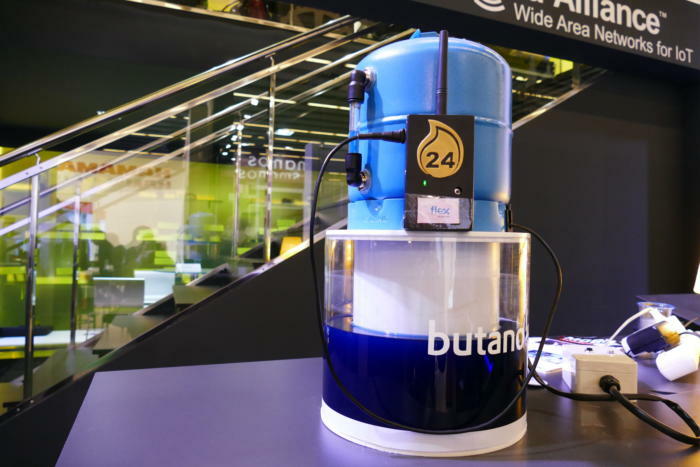 Butano24, a Spanish startup, showed off a prototype of its sensor system for butane tanks. When the sensor determines that supply is low, it sends a notification to the butane customer. 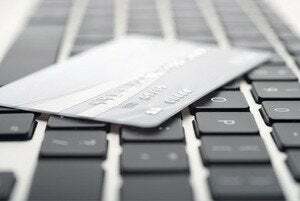 They can then hit a button on an app to order a refill within a set period of time. Here, a black cable runs from the sensor to the module strapped to the tank, which interprets the data and sends it over a LoRaWAN low-power wireless network. One of the simplest industrial IoT devices at the show was an on-off button developed by Actility, shown here opened up with the electronics inside. It's designed for retrofitting industrial equipment with the ability to communicate whether it's on or off. Every time the button is pressed, a LoRaWAN radio inside sends a message to centralized software about its status. Some newer industrial gear is already equipped with this capability. 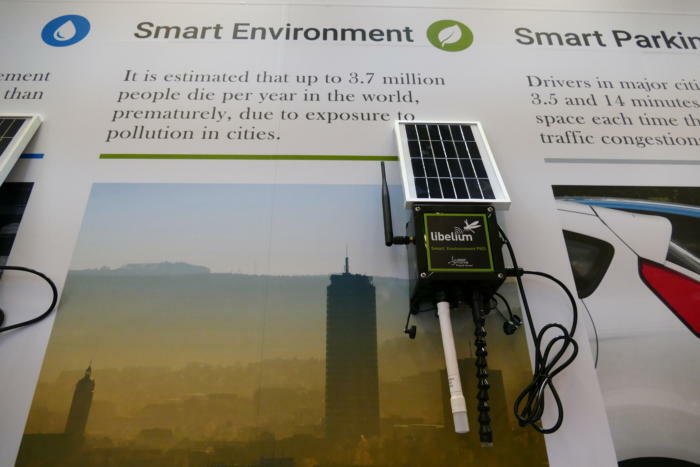 Libelium, a Spanish manufacturer, showed a variety of environmental sensing modules. This one has temperature and light sensors attached at the bottom, but there are more than 100 options for different sensors to plug in. Cities and companies, who buy the modules through system integrators, can also choose among more than 15 networking options, including Wi-Fi, LTE, and SigFox. 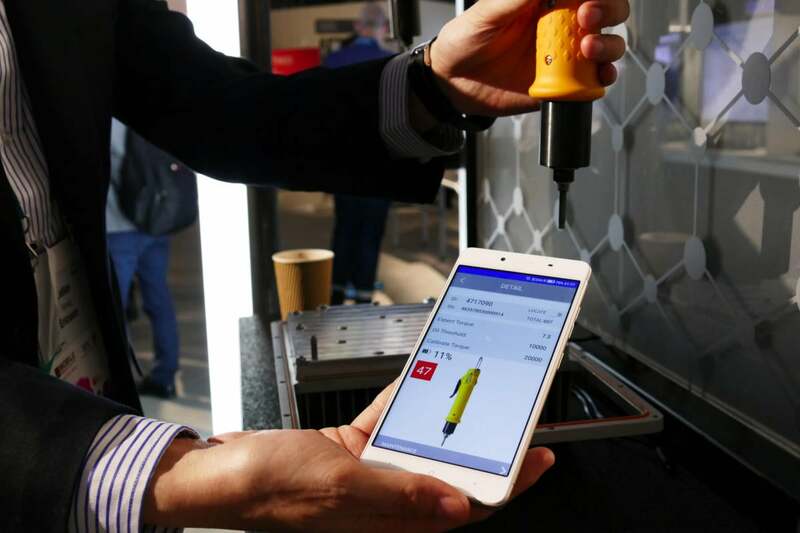 Ericsson demonstrated a connected screwdriver it started using this year in its factory in Nanjing, China. It was looking for a more effective way to handle calibration of the electric screwdrivers, which has to be done periodically so screws aren't too loose or tight. Ericsson added an NB-IoT low-power communication module to each electric screwdriver to monitor how many screws it has put in. This one has done 47 since it was last calibrated. The data lets calibration crews know which devices to work on, rather than handling them all on a regular schedule. 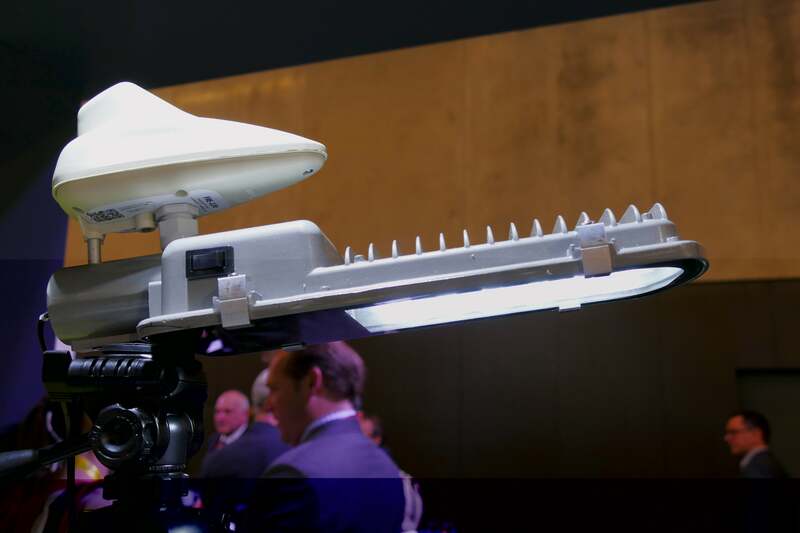 Flashnet, a Romanian startup, makes the streamlined module that's attached to this streetlamp. 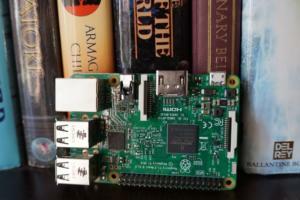 The module connects the light to a wireless network so it can be remotely dimmed or turned off and on. 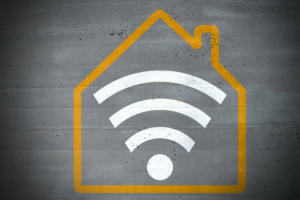 The device can also save a schedule for automated lighting that's been sent over the network, so if the wireless link goes down the light still works. 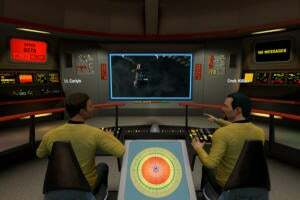 The modules can use a variety of wireless protocols. They have been deployed in Moldova, Hungary, and Romania, and Flashnet is talking with Deutsche Telekom about a possible rollout using NB-IoT. 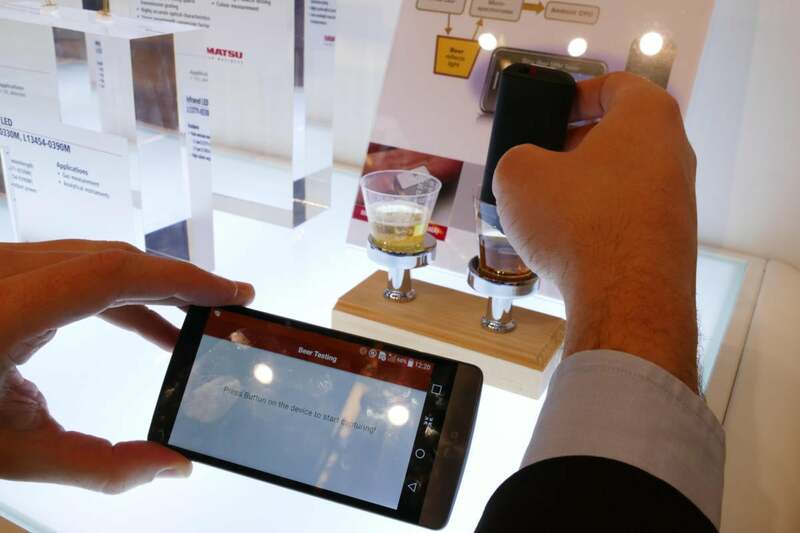 After all those IoT rollouts, it may be time for a beer (possibly the world's smallest). This demonstration by the photonics company Hamamachi showed how spectrometers can be used in the food and drink industry. A tester shone a light through each beer onto a reflective surface underneath. The way the light traveled back through the beer allowed the sensor to classify the color of the beer. A brewer could use this to determine whether its product is coming out right. The same principle is used to detect whether a supplier's milk has been watered down.